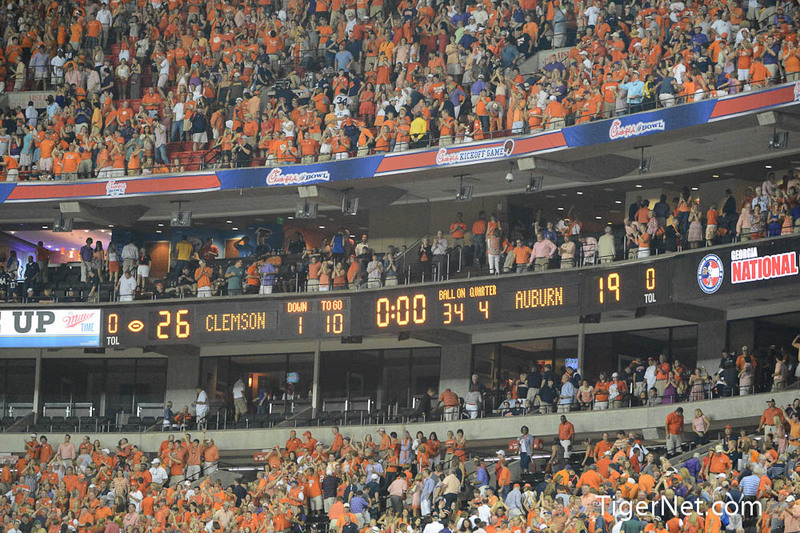 Sometime late Saturday night, the realization that Clemson beat a talented, albeit not great, Auburn team finally began to sink in. I tend to keep my hopes and emotions in check, so that if it goes bad (see GT 2004), the fall isn’t too far. So throughout the game, I kept waiting for a GT-esque moment to occur. And I had good reason since I had already witnessed blown coverages, dropped balls, near fumbles, helmet issues, and an interception on the first play of the fourth quarter. 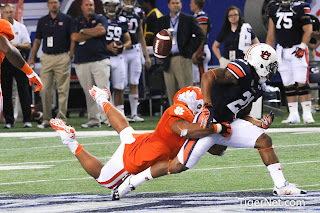 So when Vic Beasley went all Superman on Frazier, I was finally able to exhale. And even then, it took another hour, or until ESPN finally played the highlights, before I was able to relish what our boys accomplished. And now, a few days later, I am able to look back and analyze the game. To see what went right (Ellington/Boyd) and what still needs work (Secondary/D-Line). To see where questions were answered and where more need to be asked. The good news is we are doing this following a win, where good deeds can be celebrated and mistakes learned from. To lay out the review, we will take the same categories as the preview and give them a letter grade. Chad Morris put together a great game plan for this offense, especially when you consider that Auburn broke in a new DC. The pistol formation worked wonders for Ellington and the running game, the receivers were open and in play-making position, and the line held up did well. There were a few instances where one could argue Ellington needed more carries, but the offense put on a fine performance. 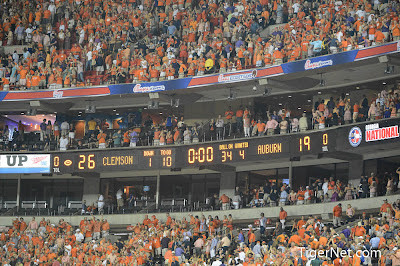 On the other side, Venables had quite job to do to regroup from last year. The tackling was better, players looked more confident in their assignments, and the red zone defense was fantastic. However, Auburn picked up yards in chunks on the ground, there were coverage issues in the secondary, and the linebackers couldn’t get off blocks. But overall, the good far outweighs the bad – and once this group gets more experience, they should get much better. 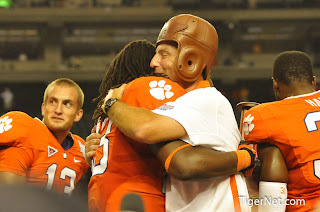 Unfortunately, there was no great soundbite from Dabo to go with last year’s celebration. And there were a few clock management issues, but this team was ready to play, they were physical, and things seemed to move in a smooth procession. This is a tale of two groups: backs vs receivers. Boyd, Ellington, & crew played fantastic, if not above their heads. Boyd was near perfect, both in scrambling and throwing (minus a few instances where he needed to get rid of the ball). 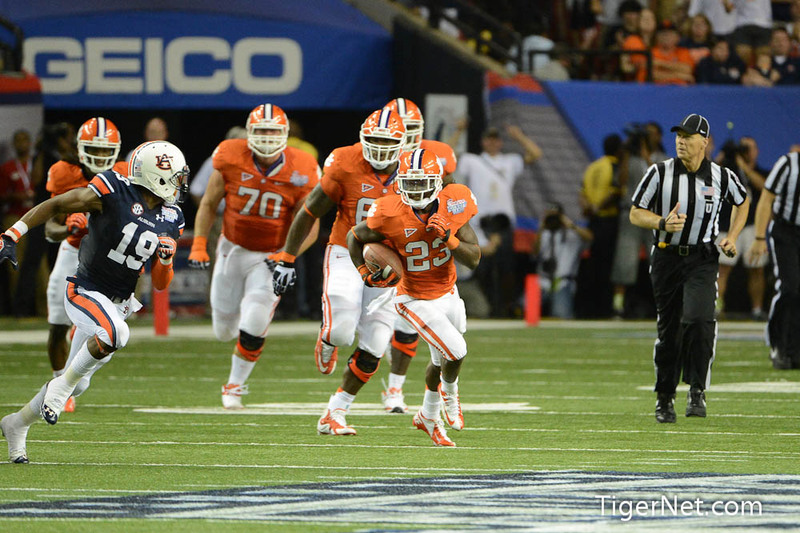 Stoudt looked comfortable with the offense during Boyd’s forced break. But better than Boyd was Ellington. He was, as he stated “relentless”, and it trickled down through McDowell and Howard, as they looked solid in their roles. The receivers, on the other hand, struggled. Not sure if it was the early penalties negating big gains, first game jitters, or just a lack of concentration, but the Tigers made it hard on themselves. Each of Ford’s drops would have been first downs, including one from inside the 5. One of Hopkin’s drops could’ve gone for six, and Bryant’s miss cost another scoring opportunity. But the unit wasn’t a complete disaster. No fumbles, they were constantly open, blocked well, and no one was injured. If this group catches a few balls, this team could be something special. We knew two things about this group coming into this season: the secondary may struggle and the linebackers could be great. Saturday’s result was somewhere in the middle. The secondary struggled in coverage and gave up multiple big plays in the passing game. However, they were stout in run coverage, especially Meeks. It seemed like their plan was to make Frazier beat them with his arm, and while he made a few big plays, they never broke. As for the linebackers, they were the opposite. 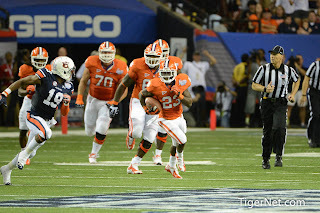 They seemed to struggle in the run game, especially keeping containment and fighting off blocks. Not sure if that is scheme or size, but it will need to be improved, especially before playing run heavy teams like GT & UCS. However, they seemed more at ease in pass coverage. They tended to keep plays in front of them, pursued well on the outside, and even disrupted a few passes. Next up: learning to chip the receivers off the line. The good news is there is this group has the greatest room for improvement. If the secondary improves its downfield coverage and the backers become more physical, this group can be great. A major concern coming into the game would be lack of experience and whether or not the line can jell as one unit. They definitely jelled, but the inexperience cost them, most notably Shatley’s false start on the goal line. But, any time you run for 320 yards, the line deserves much of the credit. They were the most physical I can remember and got great push; however, the talented Auburn D-Line caused problems in pass protection, especially on the outside. Hopefully that will improve with more snaps because there are some nasty D-Lineman to come from FSU, VT, & UCS. Inconsistency is the term that comes to mind with this group. On the last drive, they looked unstoppable. Early in the game, they looked lost. And the result is somewhere in between. The D-Line got decent pressure on Frazier and kept him uncomfortable in the pocket, which was the task, but they also had trouble keeping outside contain and stopping the backs in the run game. The containment issue is technique while getting off blocks is physicality. The offensive line showed both. Not it’s the defenses turn. We knew this group had concerns, and the first game did nothing to make us feel any better. But the season is long – and they’ll get better, much better. Catanzaro was 4-4, Benton dropped a punt on the 1-yard line, all but one kickoff was a touchback, and there were no major gaffes. By all accounts, this should be an A or A+, but two subpar returns by Martavis Bryant put the offense in poor field position. Luckily the only thing it hurt was the grade. Coming into this season, Clemson had many questions. Questions about both sides of the line; questions about secondary; questions about punting. Following the first game, we now have answers. And we are mostly pleased with what we saw. It’s not often you get to celebrate a win by looking back and counting how many mistakes you made. But that seems to be the theme for this game. It wasn’t pretty, it wasn’t amazing, and it wasn’t perfect. But it was a win, a hard fought and well-earned win. And credit is due to all units and all players and all coaches. Well done Tigers. Well done. Overall I agree with your critique..and thank you for the time & effort this took for us to enjoy and learn. GoTiGERs! Mr. Bulb, thanks for the kind words. I've thoroughly enjoyed your stories on TigerNet. Thanks for your time and effort, as well.